This is my 2000 model Squier Telecaster. My mom bought it for me for my birthday back in 2001. It was originally the “fat” variant, with a humbucker pickup in the neck and a traditional Telecaster pickup in the bridge position. I really didn’t care for the obnoxious ceramic magnet single coil in the bridge position, so I bought a humbucker bridge and added the Guitarfetish Surf 90s. The Surf 90 is an interesting pickup. It’s a single coil in a humbucker case. It is supposed to sound like an old DeArmond Dynasonic. I figured that hey – the Dynasonics are supposed to be ‘twangy’ pickups, and the Telecaster is supposed to be ‘twangy’, so let’s combine them! It worked rather well. 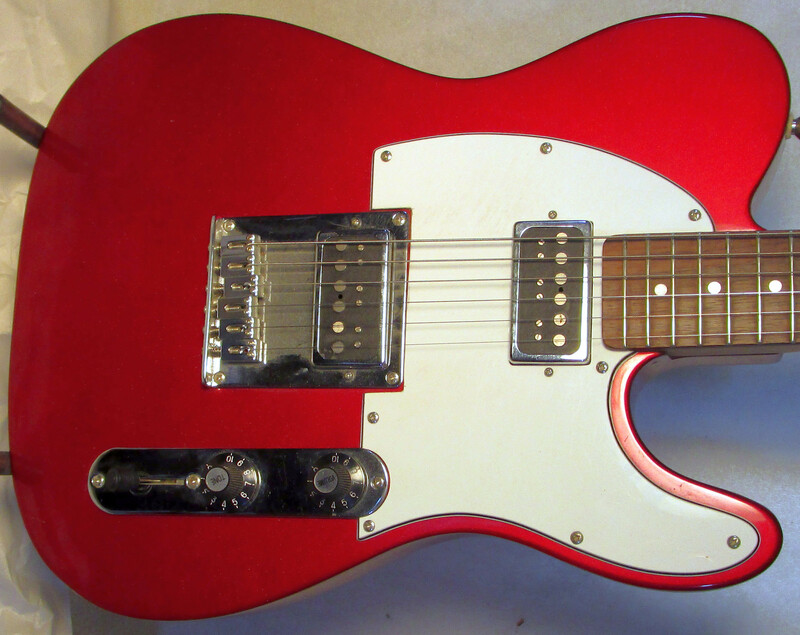 To make the guitar stand out even more, I reversed the control plate, ala Bill Kirchen. Then I put on the Muddy Waters volume and tone controls. I really like this arrangement. Working the volume control is so much easier. The bridge Surf 90 is a tad too dark for my liking. Sounds great, but lacks a certain bite. It has alnico 2 magnets. I suppose I’d like it better with alnico 5’s. Too bad there’s no easy way to change them. Doesn’t really sound much like a Telecaster anymore, but it’s still cool. The neck pickup is nice and fat. Not the clearest, but you can at least still hear the individual strings. It’s not all that different from the original humbucker, to be honest. As you might expect, the magic happens in the in-between position. That’s where all the twangy goodness comes from. With both pickups in parallel, tone just oozes from this guitar. It ‘hits above it’s weight’ – lots of tone for such a cheap guitar. Part of the reason for the more ‘expensive’ tone is that this is a true ‘string-through’ Telecaster. The strings go through the body, like the expensive Teles. Strings mounted to the bridge is a sure sign of a cheap Tele. 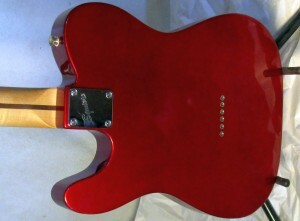 But then a few people actually do prefer the sound of the top-mount Telecasters. The neck on this thing is of the ‘baseball bat’ variety. I really do not like that. My thumb cramps like you wouldn’t believe. It is downright painful to play this for long periods. One day I’ll get the sander after it and profile it. Other than hurting my thumb, the guitar plays well. I’d prefer a contour body – screw tradition! I would gig with this guitar. This entry was posted in D.I.Y. and tagged cort, fat tele, guitarfetish, squier, telecaster. Bookmark the permalink.